Steinway & Sons, Year 1888, Model A-1 6'2" Ebony grand serial# 62256 - - - Status: Restored. In showroom. The Steinway A-1 6' 2" 85-note grand was introduced in 1878, and is considered by many to be the first fully modern grand incorporating most of Steinway's distinctive inventions, including the sostenuto middle pedal, the tubular action frame with modern repetition wippens, duplex and triplex scaling to enhance treble harmonics, enabled by the "Capo D'Astro" or treble capo bar incorporated in in the stringplate. This instrument is a rare model A with the treble "bell" or rim brace that Steinway introduced in 1883, which is now used only on larger Steinways such as the Model B and Model D. This instrument had one major past renovation in the 1930's or 1940's, with installation of a replacement Steinway diaphramatic soundboard and square-tapered legs for the original "fireplug" legs. The previous owner was a professional musician who reportedtly toured with this instrument, including playing Carnegie Hall. She brought the instrument to play for herself and others when she entered a retirement home, where it was left in a state of disrepair after her passing. 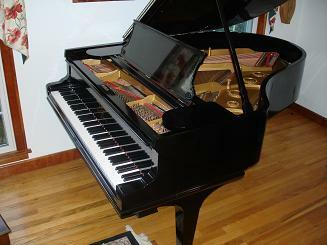 It has been completely restored at Historic Pianos in 2008, including case repair and refinish in gloss black, new Bolduc pinblock, German #2/0 nickel-plated tuning pins, regilded stringplate, new German keytops (replacing low quality 1940's plastic) and complete action regulation and advanced balancing. The instrument has a rich, mellow, full tone with the signature Steinway "growling" bass. The fully regulated action is extremely responsive with a uniform, medium touchweight over the full range.